Research indicates that cycle finance sales could easily be increased between four and five-fold with a recent consumer survey (by Pay4Later) reporting that 93 per cent of customers were positively influenced by retail finance. So what’s restricting growth? Specialists too often lag behind corporate-dominated retail sectors in implementing retail initiatives, but this needn’t be the case. Retail finance is possibly the easiest and cheapest form of promotion a shop can implement. It really can be as simple as just putting a swing ticket on a product. With five different APR rates to choose from, payment terms from between six to 48 months and entirely flexible deposits, finance offers far greater flexibility than most other promotional offers and at a reduced cost to the business. The main attraction of finance to the consumer is being able to spread the cost and this has never been truer than in the current economy. The survey reported 57 per cent of consumers made a purchase purely because finance was available. A 19.5 per cent APR is comparable to the rate charged by many credit cards, carries no cost to the retailer, but allows the consumer to make a purchase and spread the cost between 18 to 48 months. Many retail sectors have become adept at mixing finance options to not only negate costs, but to make money from finance. Offering interest-bearing finance makes larger purchases of bikes and accessories more affordable at no additional cost to the retailer. In fact, offering 23.9 per cent APR pays the retailer commission. Additional sales, upselling and higher APRs can offset the cost of subsidised lower APRs used for promotional purposes. Bank loans are costly and not so easy to come by nowadays, unless you are willing to opt for Wonga’s 4,214 per cent representative APR. So, if you offer finance you need to shout it from the treetops, not hide it under your counter. 71 per cent of consumers surveyed would have postponed their purchase had finance not been ‘offered’. Finance isn’t an easy subject for many consumers to broach, the option to spread the cost needs to be very evident to the consumer, but the individual finance proposition is under your control. The finance offering in your business can look like whatever you want it to. You can openly promote ‘finance available throughout the store’ on purchases over £350. Best selling products can be at higher APRs for consumers who want to upgrade and need to spread the cost. Large ticket sales can be upsold by offering 19.5 per cent APR over 12 to 48 months. Temporary promotions can be mounted at 9.9 per cent or even 4.9 per cent APR rather than offering price discounts that would erode margins far more adversely e.g. a 4.9 per cent APR 24 month term or even a zero per cent APR 12 month offer can be more profitable than a nominal ten per cent discount offer. You even have the option to flex the repayment period, offering longer terms for higher price points to assist the upsell and increase the deposit to help the consumer reduce the repayments. 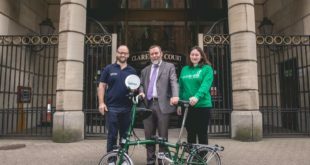 Zero per cent APR can be used for clearance, more aggressive and seasonal promotions, including packaging accessory and clothing offers with a bike to deliver a much increased transaction value and the additional margin to fund the subsidy. You can increase the deposit required at zero per cent to further protect your margin – after all, it’s comparative to the cost of a cycle to work transaction. Retail finance has the potential to fulfil every promotional offer you might need, all controlled by a swing ticket. You can even dual ticket product e.g. 9.9 per cent APR 24 months or zero per cent APR 12 months. Staff can be empowered to sell up by applying your own simple rules as to at what products and price points they can introduce finance and at what level certain APRs or terms can be introduced. It’s a stepped offering that’s easy to learn and apply. We’ve all seen it on the High Street, so what better time to make it core to your business?